Lisa was born into Above the Clouds and it has been a constant part of her life since. Her father, Steve Conlon, founded the company in 1982 and she began following in his footsteps early on. Lisa celebrated her second birthday at her Nepali grandparents’ home in eastern Nepal, by the age of seven had several Himalayan treks under her belt and has clearly inherited her father's wanderlust. Lisa graduated from the University of Vermont in 2007 and received her MBA in 2012. She has traveled widely and led groups throughout the Indian subcontinent, trekked in Europe, lived for a while in Patagonia, and has taught for her alma mater (UVM), on a 6-credit summer course she helped create. In the summer of 2013, Steve decided that he was ready to move on from the day-to-day operations of ATC and Lisa has since taken the reins. Above the Clouds founder, Steve has a long history of adventure all over the world. He lived in Nepal for more than five years beginning in 1972. He speaks Nepali with native fluency, and eight other languages. Prior to founding ATC in 1982, he was a professional photographer in New York and Kathmandu, and produced an album of Nepali folk music for Smithsonian/Folkways Records. While he decided to step down from the helm of ATC in the summer of 2013, he stays active as an advisor to the company, helping to put together some of the itineraries and share his intimate knowledge in the areas we travel. And of course, from time to time, when his wanderlust gets the best of him - he'll be traveling, guiding and leading some very special adventures! Hailing from Bridgeport, Ct. and a graduate of Saint Michael’s College in Vermont, Emily joined the ATC team in our Burlington office in early 2018. She's brought with her experience in the industry, a passion for true off-the-beaten-path travel, and an adventurous spirit! From her double major in History & English (Classics minor) to being an avid skier and former collegiate rugby player, her curiosity, love for the outdoors, and passion for life keep her motivated and pushing herself forward, onward, outward, and upward! This same passion has guided her through Turkey to Europe, onwards to Japan, and through South America — where she has spent time touring the Andes, Amazon, and Galapagos — to new adventures in South Asia. It's her attention to detail, belief in our style of travel, and pursuit of providing our travelers the best experience possible that has reminded us, day in and out, how lucky we are to have her as a member of the ATC family! As someone who has always been comfortable on the move, Natalie left her Midwest home after high school to attend school in the Green Mountains. In 2017, she graduated from the University of Vermont with a degree in Global Studies and minor in Spanish. Her interdisciplinary studies granted her a well-rounded understanding of the world and its inherent interconnectedness. While in college, she was blessed with opportunities to travel, live, and learn in Central and South America. These experiences opened the floodgates to her wanderlust and cross-cultural consciousness and have left her eager to experience more of what the world has to offer. Since graduating in 2017, she has been actively engaging in and seeking new adventures — her latest one being with us, at Above the Clouds! Bill Liske is a guide's guide. He trained countless mountain guides for over a quarter of a century at the Colorado Outward Bound School, and has been guiding for an equal length of time for Above the Clouds in the Himalaya and Patagonia. Bill makes his guiding look effortless, in the words of many past trekkers, which is testament to how much energy and skill go into his preparations and the actual guiding. His guiding skills are complemented by his encyclopedic knowledge over such a wide range of fields that we constantly ask ourselves, "How the hell does he know so much about so many things??". Love of mountains and climbing them is not something we normally think of as being passed on genetically from parent to child, but in Jamling's case it seems to hold true. His much revered father told him, and his brothers, "I climbed Everest so you wouldn't have to," but he did it anyway, as documented in the acclaimed Everest IMAX film. Jamling is now a much in demand motivational speaker worldwide, but is most at home in the Himalayan peaks visible from his home in Darjeeling. He is as talented and complete a group leader as we have ever worked with or met. Tsewang Bista is an insider's insider in his home territory, the former Kingdom of Mustang in Nepal. A nephew of the current king, he seems to know all 9,500 Lobas (as the residents of Upper Mustang are known) and every square inch of the kingdom. He has guided groups for National Geographic's television exploratories on the caves of Mustang, and has worked to preserve both the contents of those caves and other treasures that date back many centuries. 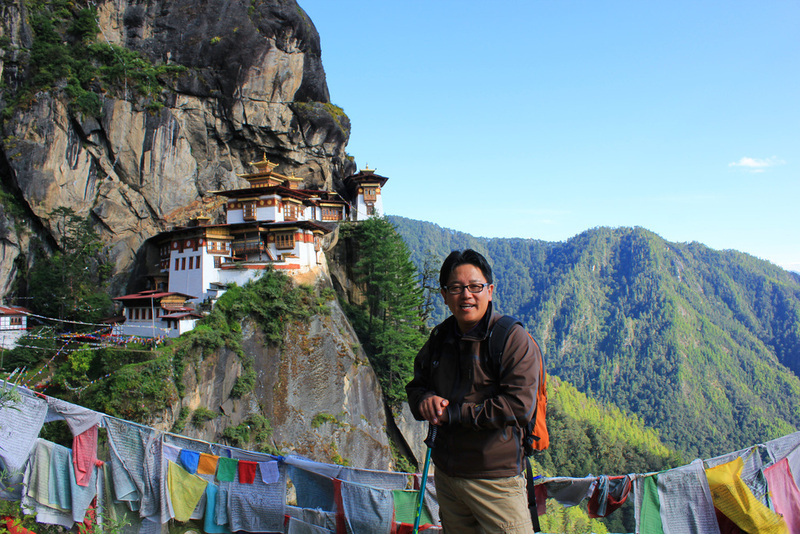 Our partner in Bhutan is a longtime friend to Above The Clouds, Dhamey Tenzing Norgay. Dhamey is no stranger to adventure, the youngest son of the legendary Tenzing Norgay Sherpa, Dhamey has explored and led many adventures into the Himalayas. To contrast his life in the Himalayas, Dhamey has also travelled much internationally during his 15 years as a corporate executive with a Fortune 500 company. Dhamey and his family currently reside in Paro, Bhutan from where he develops and organizes exclusive adventures in Bhutan for Above the Clouds - offering insight into the traditional culture and scenic beauty of Bhutan. Why Bhutan? According to Dhamey, there are a few rare journeys that we embark on during our lifetime, not just simply a vacation, but a journey for personal growth - to enrich one’s inner self through interaction with people and cultures from distant lands - he believes that Bhutan is one such adventure. Sri Raj Gurung has been with Above the Clouds almost back to our Nepal origins in 1982. For many years he worked as our primary city guide in Kathmandu, but we've recently managed to lure him out of the capital so that our Nepal trekkers can avail themselves of his vast knowledge of everything Nepali.